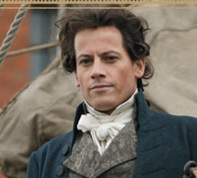 In a scene from the 2006 movie, Amazing Grace, set during the lifetime (1759 – 1833) of William Wilberforce (Ioan Gruffudd, right), Wilberforce presents his anti-slave trade bill to the British Parliament. It is a task he performs annually. Wilberforce is following the advice of his former preacher, John Newton (played in the film by Albert Finney), author of the hymn, “Amazing Grace”, who tells him that sometimes change occurs only through steady drips. The purpose of Wilberforce’s annual legislative “drip” is to eventually persuade the majority of the Parliament to make it illegal for British ships to transport slaves from Africa to the New World. “I know that many of my honorable friends in this House have investments in the Indies. Others are ship owners. And I believe them to be men of humanity. I believe you all to be men of humanity. The bill fails. Wilberforce invites a few select members of the House to join him and a few of his abolitionist supporters for a meeting at his home. The response is slight. Only one other Member of Parliament (MP), shows up. That man is Sir William Dolben, who represents a constituency which does not depend on the slave trade for its economic well-being. Wilberforce thanks Dolben for his presence. He then asks him to explain what prompted his decision to accept Wilberforce’s invitation. Dolben tells the group “he recently took passage from Sierra Leone aboard a slave ship”. Wilberforce knows it is time to do more than drip away at the problem. Wilberforce already has his answer. He will trick members of the House into a moment of revelation. Sir William Dolben, not yet known as an ally in the anti-slave movement, charters a boat and invites a number of MPs, and their wives, for an afternoon boat ride with food, drinks and music. They are enjoying themselves, until their boat suddenly halts next to what they discover is a slave ship. William Wilberforce appears on the ship’s deck and speaks to the surprised MPs and their wives. He informs them that this ship has just returned from the Indies after unloading 200 slaves, all of whom had been confined for three weeks below deck chained in boxes. The journey began with 600 slaves, men, women and children. The remaining 400 died during the trip. Their bodies were tossed overboard. The MPs and their wives, dressed in their finest, reached for their handkerchiefs. They had begun to smell odors from the slave ship. Wilberforce tells them to remove their handkerchiefs from their faces. “Breath deep. What you smell is the smell of death”. Reluctantly, they do so. Wilberforce’s strategy has worked. Previously, far removed from the smell of the deaths the Parliament has funded and sanctioned for many decades, this particular group of MPs and their wives, encounter their existential moment of reality. A two minute preview of Amazing Grace (below) captures the essence of the film, including a brief scene of Wilberforce’s meeting in the church with John Newton. “The British initially became involved in the slave trade during the 16th century. By 1783, the triangular route that took British-made goods to Africa to buy slaves, transported the enslaved to the West Indies, and then brought slave-grown products such as sugar, tobacco, and cotton to Britain, represented about 80 percent of Great Britain’s foreign income. Israel’s Zionist leaders have long been aware that if enough American voters smelled the death and suffering of the Palestinian occupation, Israel’s propaganda campaign to present itself as a victim, would collapse. Like Sir William Dolben, Americans must travel on a 21st century slave ship. They must go to Gaza and the West Bank where they will hear, feel, and smell the brutality imposed on Palestinian families, who are locked in an occupation prison. Israel’s Zionist leaders have always known they were riding into their carefully planned future on a weak platform of deception and lies. Their strategy was to disguise this platform by pretending to be humane and willing to compromise. The U.S. allies of these Zionist distorters have their own strategy. Take, for example, the recent comments by former South Carolina Senator Jim DeMint, now executive director of the conservative Heritage Foundation. Well the reason that the slaves were eventually freed was the Constitution, it was like the conscience of the American people. Unfortunately there were some court decisions like Dred Scott and others that defined some people as property, but the Constitution kept calling us back to ‘all men are created equal and we have inalienable rights’ in the minds of God. But a lot of the move to free the slaves came from the people, it did not come from the federal government. It came from a growing movement among the people, particularly people of faith, that this was wrong. People like Wilberforce who persisted for years because of his faith and because of his love for people. So no liberal is going to win a debate that big government freed the slaves. In fact, it was Abraham Lincoln, the very first Republican, who took this on as a cause and a lot of it was based on a love in his heart that comes from God. A former U.S. senator, DeMint appears to have a rather limited view of the legislative process. He also appears to know very little about Wilberforce, other than the fact that he was an evangelical Christian who worked against slavery. Of course, Wilberforce’s arena was the British parliament, not the U.S. Congress. Wilberforce died in 1833, thirty years before slavery ended in the U.S. Most U.S. Zionist leaders are no doubt better informed on British history, and perhaps DeMint also knows that Wilberforce was British, not American. But the need to keep things simple appears to have led DeMint astray. In Israel itself, Zionist leaders also rely on their ability to reshape history to their own purposes. They have long been devoted to shaping the historical narrative of the creation of the modern state of Israel. To accomplish this they have twisted and distorted their own biblical narrative for their own modern political ends. To build a modern state that is exclusively Jewish, these Zionists have been guilty of falsifying doctrine. Creating a nation from scratch was a challenge even larger than one faced by the British shipping industry. In both cases, deception was paramount. No single individual ended the slave trade, nor, for that matter, ended slavery in the U.S. The right thing to do was forced upon the British and the Americans through the legislative process. William Wilberforce finally achieved his goal. Before the final vote on the British slave trade act, William Wilberforce visited his old preacher, John Newton, the former slave ship captain, who has been tormented by his memories of “20,000 ghosts” of slaves he took to their deaths. At this point in his life, and in Amazing Grace, Newton is totally blind. In the film, he greets his former parishioner with the cry, “I once was blind, but now I see”. He asks Wilberforce, “did I write that?”. Wilberforce answers quietly, “yes, you did”. Wilberforce was the political leader of the abolitionist movement. What he accomplished, however, he did not do alone. He was supported in his legislative struggles by a team of abolitionists, which included his wife, Barbara Spooner, two clergymen, John Ramsay and Thomas Clarkson, and of course, his”old preacher”, John Newton, who was his initial spiritual guide. Another key member of the Wilberforce team was a former African slave, Olaudah Equiano, who wrote a book of his life during, and after, his enslavement. With Wilberforce’s dogged legislative leadership, and the joint educational and activist efforts of the abolitionists, the British Parliament finally outlawed the slave trade, in 1807. In the final year of Wilberforce’s life, 1833, the Parliament outlawed slavery in all of its forms throughout the British empire. Wilberforce’s close political ally, Prime Minister William Pitt, known as “the younger”, played a significant role in ending the slave trade. Pitt, the youngest man ever to become a British prime minister at age 24, died in 1806. Pitt and Wilberforce are interred, side by side, in London’s Westminster Abbey. They understood that each had a role to play in the game of politics. At one point in the film, Amazing Grace, Wilberforce asks for advice from his friend and now prime minister. Thus far, there is little evidence of a Wilberforce or a Pitt in the U.S. Congress who both understands the imperative of ending the Palestinian occupation, and who has the courage and the political sagacity to lead a Wilberforce-like struggle to make it happen. This entry was posted in -Movies and politics, -Movies and Religion, Middle East Politics, Movies. Bookmark the permalink. You communicate very well, Jim, thanks. Not only do our legislators not stand up and speak the truth about Israel and Palestine, they introduce legislation that would prevent others from speaking the truth. Fortunately, at the state level, we have managed to block that legislation in Illinois for now. Keep pointing the way!